Since launching the Wyoming Institute for the Study and Development of Mathematics Education (WISDOMe) in 2010, organizers of the College of Education’s international initiative have been hard at work raising visibility for early outcomes, promoting UW’s doctoral program in mathematics education, and planning new opportunities for collaboration and professional development. Larry Hatfield, Wyoming Excellence Chair in Mathematics Education, leads WISDOMe and the programs emerging from it. One of the first, and most visible, was the inaugural planning conference held in Laramie in September 2010. From that conference emerged preliminary agendas for four collaborative research teams. It also resulted in a monograph, New Perspectives and Directions for Collaborative Education, featuring papers produced for the planning conference. This is the first in a series of volumes highlighting research and issues related to mathematics education. Volume 2 will focus on research and theory of quantitative reasoning and mathematical modeling (QRAMM). Most of the essays stem from a doctoral-level course in quantitative reasoning created and delivered by former UW Science and Mathematics Teaching Center Director Bob Mayes. Mayes used distance technology to engage several renowned quantitative reasoning researchers with students in the class. Volume 3 is being developed out of a doctoral sequel to Mayes’ course, taught by Hatfield, emphasizing integrated (interdisciplinary) approaches to the teaching and learning of mathematics and science education. Focus will be on sharing teacher-oriented ideas for modeling integrated approaches, using student-created curriculum resources. The graduate students wrote detailed teaching resource guides incorporating mathematics and science concepts in the context of studying the gray wolves of Wyoming. They field-tested those resources at Laramie Junior High School, as well as in a secondary mathematics education teaching methods course in the college. Volume 4 will include reporting from WISDOMe’s Developing Investigations of Mathematical Experiences (DIME) research team. Another significant focus in the last year has been promoting both WISDOMe and UW’s doctoral program in mathematics education. One of those opportunities came at the annual Psychology of Mathematical Education (PME)-North America conference, held in Reno in October, where UW faculty and doctoral students were one of the largest cohorts attending and presenting. At that event, including a reception sponsored by the UW College of Education, UW’s delegation distributed brochures promoting our doctoral program and around 400 copies of the first WISDOMe monograph. Hatfield and Mayes led to establish new working groups for DIME and QRaMM, directing three sessions to foster inclusion of additional scholars to the work of the research teams. Hatfield plans to support the doctoral faculty and students to present their research at the PME-NA 2012 conference in Kalamazoo, Michigan, and to distribute the Volume 2 monograph to promote further visibility of what is developing at UW. UW and WISDOMe will be seeing international visibility as well. One of the next opportunities to share the initiative outside of the United States will come when Hatfield and fellow UW mathematics education faculty member Linda Hutchison travel to Seoul, Korea for the 12th International Congress on Mathematical Education to present research papers from their DIME and TTAME work. Hatfield also will promote WISDOMe , via his DIME research presentation at the international PME meeting, held this year in Taiwan. International partnerships may eventually extend to a cooperative agreement with Kathmandu University and Tribhuvan University in Nepal. 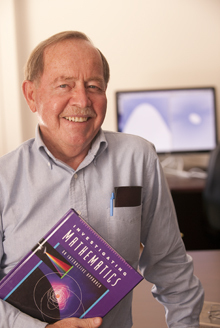 “The idea is that we would build a partnership for Mathematics Education research and doctoral education that would include both of those institutions,” Hatfield says. In addition, two WISDOMe international conferences are being planned. The first, a STEM Research Symposium on Quantitative Reasoning in Mathematics and Science Education, will be co-hosted by Georgia Southern University, UW WISDOMe, and the NSF Pathways Project based at Colorado State University for May 31-June 2 in Savannah, Ga. The initial biennial WISDOMe International Conference on Research and Practice in Mathematics Education is being planned for summer 2013 to be held in one of Wyoming’s pristine locations. As a gathering of scholars and school mathematics practitioners, it will feature both research reports and “research-into-practice” workshops, which Hatfield describes as “a unique venue in our field aimed at bridging the huge chasm that seems to exist between the work of scholars and the efforts of teachers.